Our animals are pasture raised on grass and sunshine therefore much of our production is seasonal. Monthly deliveries are scheduled for Winnipeg and Brandon. Delivery can also be scheduled for Killarney, Boissevain, and Wawanesa. Farm pick-up is also available. 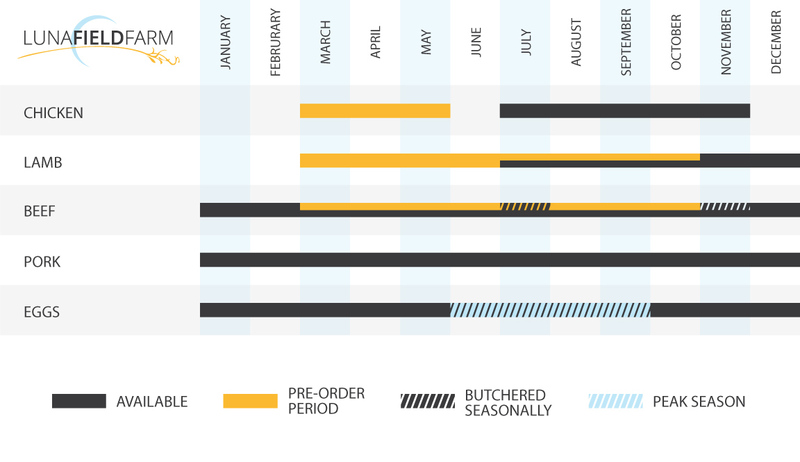 The seasonality chart provides you with a general idea of when products are available from the farm. Availabilty may vary slightly from the availability calendar. If you would like to order visit our Online Order Form or contact us by e-mail or phone. Please contact us if you would like to be added to our mailing list. We will send out a few farm updates and let you know about ordering.